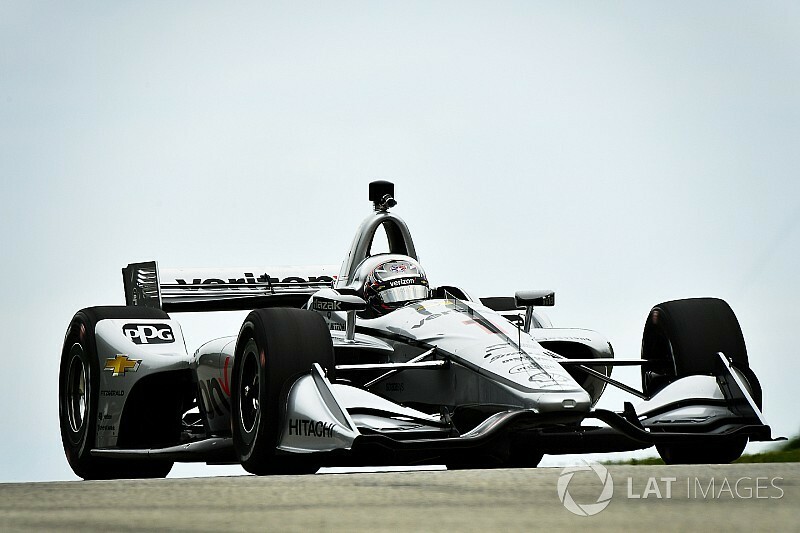 Despite Honda-powered cars looking strong throughout practice, Penske-Chevrolet’s Josef Newgarden and Will Power have locked out the front row for tomorrow’s Kohler Grand Prix at Road America. Newgarden, who swept Friday's practice sessions, but changed gear ratios mid-qualifying session, lapped the 4.014-mile course in 1min43.2026sec to edge Power by 0.0482sec. That was Newgarden's third pole position of the season, the fifth of his IndyCar career, and the third straight year that Team Penske has earned pole at Road America. Power's front-row start means he's started in the top three in all but one of the 10 races this year. Newgarden's pace was enough to beat Andretti Autosport’s Ryan Hunter-Reay and Alexander Rossi into third and fourth by 0.18 and 0.23 seconds respectively. Robert Wickens of Schmidt Peterson Motorsport-Honda, who had topped FP3 this morning, was a slightly deflated fifth, half a second behind Newgarden, while Sebastien Bourdais was sixth for Dale Coyne Racing-Honda. Rahal Letterman Lanigan Racing-Honda will be slightly disappointed that neither of its cars got through to the Fast Six, but they’re in good company as Takuma Sato and Graham Rahal will sandwich points leader Scott Dixon who was eighth for Chip Ganassi Racing-Honda. Spencer Pigot can be reasonably content with 10th and third fastest Chevrolet runner, on a weekend when the Bowtie’s top-end power couldn’t compensate for the Honda’s low-down torque. Ed Jones, like teammate Dixon, encountered traffic on his flying lap and will start 12th. Simon Pagenaud, despite having been the fastest Penske driver on black tires in FP3 this morning, and matching Power’s time from Q1G1, was eliminated from Q1G2 and will roll off 14th after failing to make the cut by 0.003s. Marco Andretti was the only Andretti Autosport driver to fail to make it through to Q2. Even more puzzling was the lack of speed from James Hinchcliffe, who was almost a full second slower than SPM teammate Wickens who had topped Q1, with the veteran saying that the ‘red’ alternate tires threw off the #5 car’s handling balance. Carlin Racing suffered a poor qualifying performance, despite Max Chilton and Charlie Kimball heading out on scrubbed reds, then switching to fresh reds – although they were barely worse than fellow Chevy runners AJ Foyt Racing. Alfonso Celis was slowest on his IndyCar debut with Juncos Racing, although the quirks of the group system means he will start ahead of both Chilton and Harding Racing-Chevrolet’s Gabby Chaves.